What can we really do about peak oil and global warming? If you want to solve global warming, here is the method: help solar to beat the price per kilowatt-hour of natural gas. I think it can happen. Consider the future of solar power. The price of panels is dropping quickly. A price of $0.50 per peak watt would have been absurdly optimistic a few years ago but it is now a virtual certainty. While solar panels may not advance as rapidly as Moore’s Law (as I read recently) they still fall in price by a significant margin every few years. I got my price data from renewableenergyworld.com. After removing the points from 2006-2008 because those years were hit hard by a silicon shortage, the data actually fit an exponential decay reasonably well. 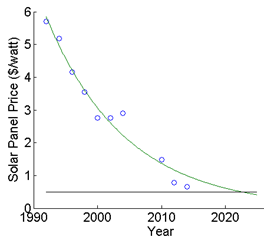 This graph shows the price of solar panels (blue circles) and an exponential fit to these data (green line). The black line indicates $0.50 per watt. More importantly, the cost of the silicon panel is shrinking relative to other costs of building a power plant. By 2025 it will be a relatively minor percentage. Installation will soon be a more significant cost than the panel itself (if it’s not already), but I suspect advanced automation will solve that (robotics is definitely a Moore’s Law technology). Final, installed prices of $0.65 per peak watt are within a few years’ reach. The main hurdle between solar and the utility consumer at that point will be the simple fact that solar is non-dispatchable. Simply put, no sunlight equals no power. That’s bad if you need to send power into the grid during (for instance) the night. Assume for a moment we can buy enough storage for the night-hours (we’ll come back to that). How many more panels do we need to compensate for the capacity factor? In Arizona, a panel might get 10 hours of sun per day. That means that we need to store 58% of that energy for release during the other 14 hours of the day. So, for one system-watt of continuous, 24/7 power, we will need 2.4 watts worth of panels and their installation. That gives us a final panel cost of ~$1.6 per system-watt assuming $0.50 per watt of panels and (greatly improved) installation costs. Sample calculations show what prices are needed for a a 24/7 dispatchable solar/storage plant to beat natural gas prices for electrical generation. Now, the system price calculation needs to account for the price of storage. Several battery technologies are shooting for $0.10 – $0.30 per watt-hour. We will need 14 watt-hours of storage to last while the sun is down. If we guess $0.25 per installed watt-hour of storage then storage costs about $3.50 per system-watt. The total price per system-watt (continuous, 24/7) will be about $4.70. Adjust for interest and a 30 year lifetime you get a capital cost of $44 per megawatt hour. Since you have 2.4 panels per system-watt, you will need to multiply overhead and maintenance costs by the same (relative to conventional solar-PV). 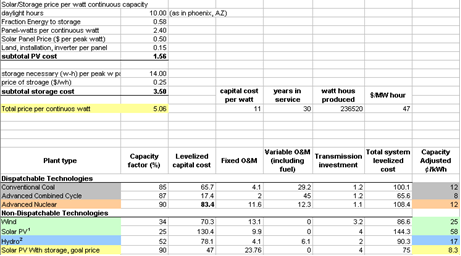 Final price per kilowatt hour is 8¢ per kwh, as calculated per the model provided by the EIA. Some of my assumptions will prove imperfect but some of the real prices will be lower than my estimates. I hope that my calculations indicate that solar electricity will, eventually, be (nearly) as cheap and dispatchable as any power available on the market. There is another reason for optimism: the more people who invest in solar, the further that innovative research can drive down the price of panels, installation and storage. There is plenty of room to improve the price-performance beyond my assumptions. I suggest (based on reasonable numbers, not purely intuition) that energy is probably going to be OK and that sustainable energy is going to become competitive with CO2 intensive energy. It may not stay at the 8 cents per kilowatt-hour that many of us have come to know and love, but it will be available and (reasonably) abundant. Just for the record, though, we could speed up this whole scheme and get off the fossil fuel faster if we went nuclear. This entry was posted in Science and tagged Batteries, Calculations, electricity, energy, Solar, storage on March 9, 2014 by Peter.